Mevotech vs Moog – Which Brand Is Better? When it comes to tuning cars, suspension parts are something that many car owners overlook. Most car owners believe that purchasing a set of wheel bearings or bolts by any brand will suffice; however, this is simply not true. Choosing the right suspension parts is just like choosing the right clothes. That’s what the Mevotech vs. Moog comparison is all about. Have you ever rotated the steering wheel of your vehicle and heard an annoying screeching noise? Well, that’s your car’s wheel bearing, and it’s demanding a replacement. On the other hand, the control arm is also a critical part of your car’s suspension system. It attaches the wheels to the car’s frame and provides your car with stability. Therefore, buying a good quality control arm is also important. Here, in the Mevotech vs. Moog comparison guide, I’ll discuss the wheel bearings and control arm by both brands in detail. I’ve tried and tested both before compiling this guide. I’ll review the products in detail, discuss their features, pros, and cons. By the end of the comparison, you’ll be able to make an informed choice. The process of buying a control arm can be pretty challenging. I’ve been through the process, and my first purchase was a disaster. Nevertheless, I bought Mevotech control arm and Moog control arm and tested both the products with different vehicles. The Mevotech Control Arm is designed to withstand all kinds of driving; even on tough and rugged terrains. Unlike many other brands manufacturing control arms with bushings made of rubber-based compounds, Mevotech Control Arm is made of polyurethane bushings. The material provides great resistance to degradation and corrosion caused by mud, oil, and road salt. Mevotech Control Arm comprises premium, high-quality ball joints, and strong polyurethane bushings to suit different kinds of driving and vehicles. The control arms made of easy are easy to grease for enhanced ball joint operation. Mevotech Control Arm forms a study connection point between the body of the wheel and your vehicle. This allows the wheel to freely bounce on the road while the attachment stays strong. 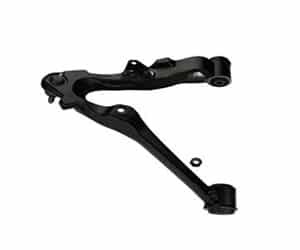 The Mevotech Control Arms are crafted to improve the durability and lifespan of wheel frames. They also help in restoring your vehicle to the original suspension specifications as much as possible. The thicker forgings on the control arm reduce greater twisting and flexibility of the product. I am using the product with my Honda Pilot 2015 model and am satisfied with the performance. When it comes to high quality suspension parts, Moog is one brand that many car owners prefer. If you want to get the wheels of your car back in line, you can buy Moog’s R-Series Control Arm. It provides steady and secure steering when required. 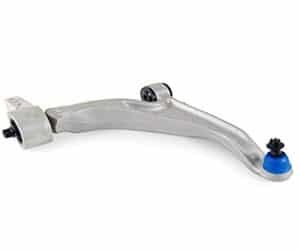 The R-Series Control Arm is made of aluminum or steel and engineered in a way that it reduces friction and wear. It is a high-quality suspension part that is crafted to meet the daily demand of your driving. The Moog Control Arm comprises Moog Problem Solver bushings and ball joints for better performance and ease of installation. The ball joints come with many design enhancements such as a new, patent pending basic dust boot, an enhanced forged housing, and a patent pending design of the gusher bearing. Overall, Moog Control Arm is long-lasting and durable. The material quality is high, and the control arm is sturdy. Comes with grease fittings on the lower joint. Formed using OE-style geometry for better alignment and fit. Pre-assembled with ball joint and bushings. Suitable for various foreign and domestic vehicles. Comes with bench testing guarantee and thorough inspection. While some parts of your vehicle are meant to be stationary, others such as axles are designed to move. This stationary and movable combination can lead to increased friction which can damage your car. I had no idea how to pick the best wheel bearing when I bought my first wheel bearing, and like the control arm, it was not the best decision. I thought it would be a good idea to try wheel bearings by the same brands. Mevotech Wheel Bearing is designed keeping in mind the OEM specifications and then identifying, studying, and enhancing areas that require improvement. I’m using Mevotech Wheel Bearings with my Ford Super Duty F-250 Truck, and I like the performance of the product. Using the Mevotech Wheel Bearing and Hub Assembly, you can restore the precise positioning of the wheels for a safe and smoother ride. All you need to do is replace your warped or worn out wheel bearings and hub assembly with long-lasting and high-quality wheel bearing and hub-assembly system by Mevotech. All the parts of Mevotech Wheel Bearing and Hub Assembly system are lubricated in advance to reduce wear and friction. Also, they’re sealed during manufacturing for greater protection from debris and dust on the road. 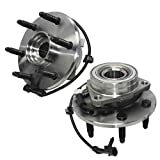 Mevotech Wheel Bearing and Hub Assembly can be an ideal replacement for your vehicle. The integrated flanges help reduce shaking of the vehicle and preserve the integrity of the inner bearing. The heavy-duty and strong integral raceway cuts down vibrations and enhances stiffness. 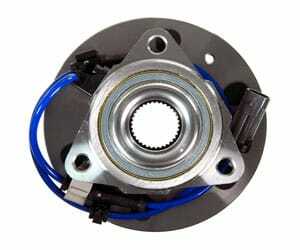 The oversized ball bearings allow the hub to bear the extra load and increase its lifespan. Pre-lubricated with grease to minimize wear and friction. Reduces shaking on the vehicle. Reduces vehicle noise and allows your vehicle to run smoothly. Easy to install and provides an excellent fit. If you’re sick of the rumbling noise in your vehicle as soon as you begin driving, Moog Wheel Bearing can come to your rescue. Moog Wheel Bearing and Hub Assembly are treated with heat for optimum hardness and depth to support greater load capacity. They are designed to provide your vehicle with more endurance, proper function and fit, maximum exclusion of contamination, and safety while driving. 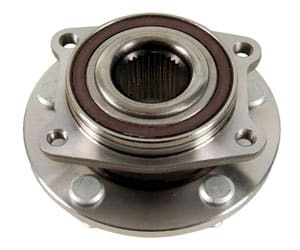 Moog Wheel Bearing and Hub Assembly is crafted to deliver reliable and smooth performance and overcome problems. So, if you’re looking for superior-quality wheel bearings and hub assemblies for quiet operation, smooth driving, reduction in rolling resistance, and assurance of proper functioning of ABS, I recommend you use Moog Wheel Bearing and Hub Assembly. I’m using the product with my 2017 Mazda 3 and have not encountered any issues so far. Precision match components for quiet and smooth operation. Better conductivity of the ABS signal due and strong connection due to high-quality copper and polymer wiring. Contamination protection by the quad-lip seal. Now that you’ve gone through the detailed reviews of Mevotech and Moog control arm and wheel bearings, you have an idea of their features, pros, and cons. What do you think about both the brands? If you ask me, I prefer Mevotech over Moog. Mevotech products are more affordable and high-quality when compared to Moog products. Speaking about the control arm, the Mevotech control arm comes with ball joints and bushings; whereas the Moog control arm comes with ball joints only. You’ll have to purchase the bushings separately. Wheel bearings and hub assemblies by both the brands are equally good. 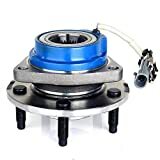 However, some customers have mentioned that the ABS sensor on the Moog Wheel Bearing and Hub Assembly did not work properly. I personally did not experience any issue with either of the brands. Overall, I would say that Mevotech is a better brand. However, I suggest you pick the brand and products based on your exact requirements, vehicle type, and vehicle model. Does Mevotech have Lifetime Warranty? Is Mevotech Made in the USA? How long to Mevotech products last? Does Moog have a Lifetime Warranty? Are Moog Made in the USA? How long do Moog parts last? Yes, Mevotech offers Limited Lifetime Warranty on suspension parts. All Mevotech product parts are engineered in Canada and designed in a factory in North America. All Mevotech products are long-lasting and durable. They come with Mevotech Limited Warranty which states that the products will be free from material-related defects and workmanship for the useful service lifespan of the vehicle on which the product was originally installed. Mevotech products are a combination of great price, great quality, and even better customer experience. They’re tested in adverse conditions and inspected thoroughly before they’re sold. Moog provides Lifetime Warranty on many components. Moog Control Arms and Hub Assemblies carry a 3-Year Warranty. Moog parts are manufactured in over 16 countries. They’re not just made in the USA. Moog is a global brand, and its parts are made worldwide. Moog is a trusted brand, and Moog suspension parts are durable, reliable, sturdy, and high-quality. Moog wheel bearings last for about 136,000 – 160,000 km or 85,000 – 100,000 miles. Moog Control Arm can last for a long time and does not require replacement until it gets worn out or torn. I hope you found the Mevotech vs. Moog comparison guide useful. While I recommend Mevotech products, Moog isn’t bad either. It’s just that Mevotech products have a slight edge over Moog products when it comes to durability, quality of construction, and design. If you have any other questions about Mevotech or Moog, please feel free to post your questions in the comment section below. Also, if there is any other brand that you would like me to review, let me know.